The robo-advisor has hit the 401(k) space. 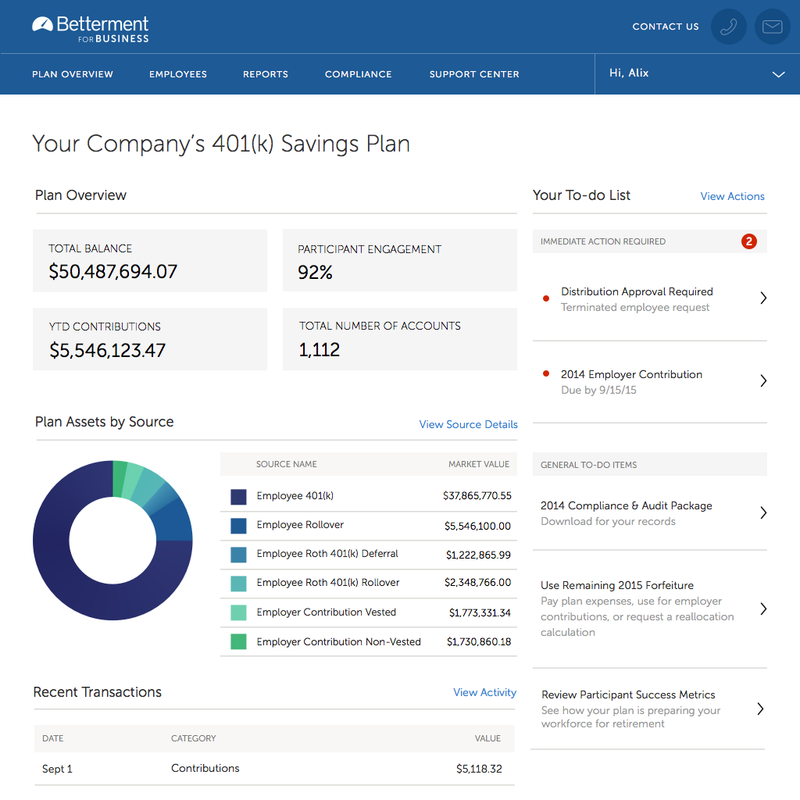 Betterment — one of the biggest online advisors in the field, with over $2.6 billion in assets under management — is launching a new 401(k) platform. The Betterment for Business plan management and investment advisory service will closely mimic the company’s consumer platform. As with Betterment’s individual accounts, 401(k) plan participants’ assets will be invested in a globally diversified portfolio of low-cost exchange traded funds, a departure from the target date funds that dominate typical 401(k) portfolios. Account holders will also be able to open other accounts with Betterment, including both traditional and Roth IRAs and taxable investment accounts, that can be managed in step with their 401(k). “No one gives holistic advice about what to do in your 401(k), but also what to do in your IRA and your savings and other investment accounts. We’re bringing that holistic advice about retirement and other accounts to 401(k) participants and employees,” says Jon Stein, Betterment’s founder and CEO. Management fees will range from 0.10% for the largest employers with over $1 billion in assets to 0.60% for the smallest employers. Employers can choose whether to pay those fees themselves or pass them on to employees. The fees, Stein says, are the lowest in the industry. The average target date fund carries an expense ratio of 0.78%, according to investment research firm Morningstar, which results in $7.80 in fees per $1,000 invested. Stein says participants in 401(k)s managed by Betterment for Business will pay less than that, including the management fee and investment expense ratios. Employers will benefit from no setup costs (for companies with over $1 million in assets) or ongoing annual fees. Betterment also touts paperless onboarding and technology and design that offer an easy client experience. Betterment for Business will officially launch in the first quarter of 2016, but Stein says the platform already has a handful of commitments from early clients — including Earnest, a lending startup — and plans to add more employers throughout this year.